The final round-up for Sugar High Friday #27: Chocolate By Brand. These are the last entries for the event and thanks to everyone for their participation. I was overwhelmed by the number of entries (to say the least…) but was happy there was so much interest in chocolate and was amazed at all the beautiful and well-crated dessert folks are making out there. It was also a pleasure to learn about a few new chocolates and I plan to do a post in the near future to write more about them. Due to the very high number of entries, over 100, a few photos in this post aren’t included. If you’re one of those who did send a properly-sized photo (100×100) and it’s not here, please re-send it to me and I’ll insert it. Desolé. Thanks to Jennifer, the Domestic Goddess who came up with Sugar High Friday, the event on which these posts are based. Starting off is a gorgeous Schokoladen-Ingwer-Tropfen mit Zimtsauce und Mango Püree, a professional-looking, teardrop-shaped river of Chocolate Ginger Tears with Cinnamon Custard and Mango-Ginger Puree which are so pretty, you’ll shed a tear too! Brigitte used Michel Cluizel couverture from France. Two great tastes, one great dessert! Peanut Butter Cup and Chocolate Chip Bars from Lisa Yockelson, using Callebaut chocolate. Samantha’s raised the bar for bar cookies with these buttery beauties. Karen at Familystyle Food whipped out a simple and sensation Chocolate Truffle Tart. using her ’embarrassment of riches’ (check out her chocolate stash…it rivals mine! 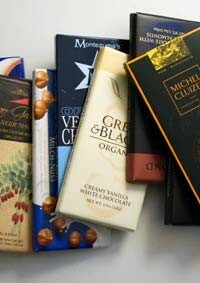 ), she plucked one tablet of Nestlé Chocolatier 62% bittersweet chocolate. So here’s her Chocolate-Raspberry Truffles. She wanted to use a local chocolate, but ending up using Callebaut 53.8% drops. Abby at Confabulation Cooks goes all-out with Warm Chocolate Pudding using the ever-popular Lindt brand bittersweet, in her adorable new ramekins she broke out (not literally!) just for Sugar High Friday. Another adults-only recipe, although a quick visit to Cucina Bella’s site shows a younger-sort rifling through her chocolate stash! She used Trader Joe’s bittersweet chocolate for her Adults-Only Mudslide Mousse with a mature measure of Bailey’s Irish Cream. I think you’ll have to decide that for yourself, but Brigid at One More Bite answers the question Does Brand Matter? In her classic S’mores, she finds that good-‘ol Hershey’s hits the spot. And from Trini Gourmet comes a fusion-filled recipe, Upside Down Chocolate Cake with a thin, biscuit-like crust and a cakey, creamy layer of fudge on the bottom. She broke out her Trinidadian chocolate for this special event: Blendo’s. Get yer freak on with Chocolate Orange Bread Pudding from Petra at Food Freak. Using fair trade chocolate from Ghana, Fairglobe brand, with 70% cocoa solids. Gambini came in at the very last-minute with Experi-Mint-Al Brownies with York Peppermint Patties. Over at Yum Sugar there’s no better hit of chocolate than Espresso Double-Chocolate Chunk Cookies using her hometown (San Francisco) favorite, Ghiradelli. These dunkable drops David deems delectable. Say bonjour to La Cerise, who gives us a video presentation on how to make the fabulous chocolate ruffles on her Meringue d’Automne, Chocolate Meringue Ruffle Cake, from Pierre Hermé. She hauled back Valrhona’s Manjari 64% chocolate from Paris for these chocolate-rich beauties. Jenny Sais Quoi poured through recipes before deciding on Gourmet magazines Milk Chocolate Pudding made with a chunk of Lindt chocolate (she works near a Lindt store…how lucky is that? ), and a scoop of Ghiradelli cocoa powder. Bron made a Chocolate Custard Tart, which looks as smooth as silk, using two different chocolates from New Zealand, Whittaker’s and Equagold. And the final flourish was home-grown raspberries, since it’s summer down under right now. Next month’s Sugar High Friday #28 hostess Jasmine, came in with Nigella’s Chocolate Gingerbread Cake using Callebaut chocolate morsels and Fry’s cocoa powder. Yup David, I’m absolutely sure it’s 53.8% cocoa solids (or at least that’s what the packet says). It may simply be a quirk of Australian labelling laws, but the product is Callebaut Select 811. I can send you a photo of that too if you like! Hee. I’m not sure if working near a Lindt store is lucky….or just plain dangerous. This was good fun — so many posts to read and so many recipes to try out! Thanks for hosting it! Thanks for the round-up. Just to clarify, the YouTube video on my post is mine, but I’ve also included a link to the original Alice Medrich video in the post. I just love your blog David. I don’t have one, so my contribution to your Sugar High Friday is this: I made Julia Child’s Bombe aux trois chocolat using Michel Cluizel minigrams in the mousse and the ganache and then used Pernigotti cocoa in a Texas sheet cake for the cake. Decadent dessert for Bookclub night(we discussed My Life in France). Also, sandwiched some Linzer cookies(Eli Zabar shortbread recipe via Ina Garten) with Nutella instead of jam. yummy. Oops, I should mention that I used a bar of Koko Black 60% Dark Chocolate to make a dessert spring roll – Azuki bean, Banana and Chocolate spring roll. Thanks for doing this, David. It looks great! Didn’t participate this time, but am very impressed with your hosting abilities and with the huge number of really great sounding recipes. I bought some chocolate to make something, but was stopped by sudden illness and am grateful for so many ideas of how I can now use the Scharfenberger and Trader Joe’s chocolates. Many thanks. David, that pistachio cream is yours in exchange for a session of picking your brain for ideas (and maybe a coffee)….the only question is….Milan or Paris?